Mandla "Mampintsha" Maphumulo has offered a reason for hitting his long-time girlfriend and business partner, Babes Wodumo, explaining outside of his court appearance on Tuesday that he was attacked "first". 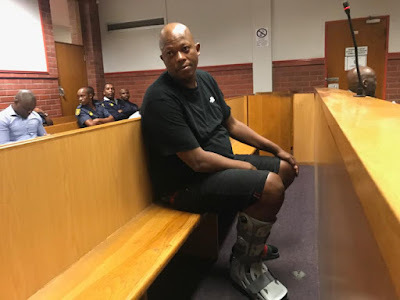 Mampintsha was released on R2,000 bail after being charged with assault at the Pinetown magistrate's court. The charges relate to video footage which shows him hitting Babes. The footage was broadcast in a live Instagram video. "We fought from the room to the bathroom, she kept hitting me while I was trying to make my way to go and wash the blood off my lips." "Babes is very provocative and she knows that I will get angry at the end of the day. I hit her twice on the back, not on her face. I was asleep when she arrived back home and was sober." "So when she comes to me and starts being violent, what must I do? When she comes back home drunk I usually leave the house. I can't allow Babes to keep hitting me because when I inform her parents, they can't even assist." "Those allegations were made by people. There are always people who are behind such things. No one truly knows what is really going on." "I have been very patient with the abuse too and I have realised that this love is no longer stable."